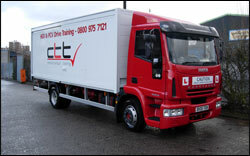 Central Transport Training was formed in 1995 and operates within the Road Transport Sector, providing training and development programmes and services to a diverse range of Private Individuals and Organisations, ranging in size from small through medium to large. Since 1996 we have invested heavily in our fleet of training vehicles and premises, relocating in 1999 to cope with business expansion. We believe in offering the highest possible levels of service and quality in all areas and are committed to an ongoing process of review and improvement. All of our driving instructors are fully experienced and qualified and are registered on the DSA Approved Driving Instructors register. "All at Central Transport Training endeavour to assist our corporate and individual clients to improve their Organisational and Individuals performance, through the delivery of professional training and skills development programmes. Collaborating with clients in order to analyse requirements and assist with business improvement or their personal development, by devising professional solutions in order to take advantage of available training and development opportunities. We aim to grow our business by a process of continual review and improvement, aiming to be the foremost transport training provider in the west midlands, offering unrivalled levels of quality and service"
Candidates are guaranteed the highest standards of training and instruction and we strive to help overcome any particular difficulties they may encounter with their standard of driving. Candidates will use the same vehicle and driving Instructor throughout their training and driving test whenever possible. In the event of unforeseen circumstances, such as mechanical or electrical breakdown, an alternative vehicle will be substituted if available. Any necessary alterations to course start and finish times, due to exceptional or unforeseen circumstances, will not affect total driving instruction hours. Whilst we endeavour to book test dates and times as required, these may vary as bookings are made with the Driving Standards Agency (DSA) and are subject to availability. Copies of our Public Liability Insurance, Health & Safety, Equal Opportunities and Complaints policies and procedures are available on request. Prices quoted are correct at the time of going to print; however CTT reserves the right to make change without prior notice. Full refunds due to candidate cancellations will only be given in exceptional circumstances and are subject to a sliding scale of charges. Central Transport Training guarantees to match or better, published, or written quoted prices of our competitors on any genuine offer of the same product we also offer.